No team celebrates its history more than the Montreal Canadiens, and you can decide for yourself whether that’s a good thing. The franchise has become legendary for reminding us about its legends. That often takes place during inspiring pregame ceremonies that the Canadiens have elevated to a minor art form, thanks largely to no small amount of practice. It doesn’t always work, but when it does, it works beautifully, as it did before Saturday night’s Game 5 of the Habs’ second-round series against the Lightning. In the moments leading up to puck drop, we were treated to a brief video featuring words of inspiration from Jean Beliveau, the longtime Canadiens captain who passed away earlier in the season. Beliveau remains one of the most universally beloved figures in the hockey world, and his no. 4 is painted on the ice behind the nets at the Bell Centre. That number loomed over Saturday’s game: four, as in the series-clinching fourth win that the Lightning were chasing for the second straight game. Four, as in the number of consecutive wins the Canadiens would need to string together after having dropped the first three games of the series. Four, as in the number of teams in NHL history that have rallied all the way back from a 3-0 series deficit. For all their past glory, the Canadiens are not one of those four teams. Not yet. When you put on a Montreal uniform, with all of that history weighing on you, you don’t get many chances to be part of the first Canadiens team to ever accomplish something. By falling behind 3-0 in the series against the Lightning, this year’s team gave itself that chance to write its own chapter in the franchise’s storied history. It took the first step by winning Game 4 on Thursday. And by the end of Saturday night, Montreal was halfway there. The Bell Centre opened in 1996, which in today’s NHL means it’s straining the boundaries of what can be called a “new building,” but we’ll allow it. It looks like a new building, which is to say that it looks more or less the same as just about any other building you’ve been in. Its main distinguishing feature is that it seats 21,273, the biggest capacity in the NHL. And unlike so many of the league’s other generic arenas, those fans don’t need the scoreboard to tell them when to get loud. They just need the team to give them something to cheer about. In these low-scoring playoffs, one goal often feels like it will be enough, and it was hard to fight that sense on Saturday, as Smith-Pelly’s goal held up well into the game’s second half. But the Lightning eventually started to take over, and by one stretch in the third period they were dominating. The tying goal felt inevitable, and it came from Steven Stamkos, the slumping captain who’s been barely noticeable for long stretches in this series. That quieted the crowd, but only briefly, and soon the fans were screaming and chanting again, almost as if in defiance. That boost helped set the stage for P.K. Subban’s brilliant feed to P.A. Parenteau, who snapped a one-timer past Bishop with four minutes left. It wasn’t an overtime goal, but it might as well have been. Carey Price was having one of those games — Valtteri Filppula may need therapy after being victimized by a ridiculous glove save — and Tampa Bay couldn’t mount much the rest of the way. There was a minor flurry in the final minute, when Montreal suddenly forgot how to clear its own zone, but this time there’d be no buzzer-beaters for the Lightning. Game 6 is Tuesday night in Tampa Bay. We’re halfway to history. In addition to those 21,273 screaming fans, the Bell Centre also hosts a few more important guests: 19 banners for retired numbers (one is for a Montreal Expos player) and 24 more for the Canadiens’ Stanley Cups. Depending on who you talk to, it may also be home to the old ghosts of the Montreal Forum. That was the team’s old arena, where the Habs won all but two of those Cups, and where all of those legends made their reputation. You used to hear about how those Forum ghosts could always be counted on to guide the team whenever it needed some extra help. The ghosts were presumably invited to make the trip to the new arena. In the two decades since, there hasn’t been much evidence that they did. The 20-minute walk from the Bell Centre to the site of the old Forum involves cutting across to Rue Sainte-Catherine, and the trip is … well, ugly isn’t the right word, but it’s not fun. It’s not much to look at, mostly uphill, and half the route seems to be under construction. As a Saturday stroll it fails miserably, but as a metaphor it works remarkably well. That walk back from the new to the old bridges the gap between almost two decades of Montreal Canadiens hockey, and those years have been not exactly ugly, but not much to look at, mostly uphill, and perpetually under construction. The Canadiens last won the Stanley Cup in 1993. Since then, they’ve made it out of the second round only twice, in 2010 and last year. Sprinkled around those two minor successes were a few near misses, lots of mediocrity, and some outright misery. That’s not so much a knock on the organization as it is the new reality of the NHL. This isn’t a six-team league anymore, and in the age of parity, teams aren’t supposed to win Cups all that often. The recent history of the Canadiens isn’t all that bad. It’s just average. But there was a time in Montreal when average was unheard of. From the Original Six era through 1993, a span of 51 years, the franchise never went longer than seven years without winning the Stanley Cup. That held true even as expansion arrived and the league more than tripled in size. They kept winning those Cups because this was Montreal and they were the Canadiens, and they had the ghosts of the Montreal Forum to help them along. Today, the Forum is a movie theater. I’d describe it further, but I don’t really need to, because if you’ve ever been in a modern movie theater, with its generic popcorn lines and self-serve kiosks and unused arcade games, then you’ve got the picture. On Saturday, if you didn’t feel like watching Game 5 at the Bell Centre, there was always Furious 7 at the Forum. There are reminders of where you really are. There’s a small memorabilia store where you can pay $149 for “new” bricks from the original Forum, which sounds impressive until you realize that means somebody is still pulling bricks out of the building you’re currently standing in. They’ve painted a faceoff circle on the floor where center ice used to be, and even put a few rows of original seating around it, but the seats are too close, so the view is all wrong. The whole thing is all wrong. The Forum is a movie theater. That shouldn’t be depressing, but it is. 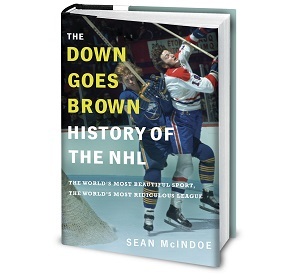 If you’re a hockey fan and you ever have the chance to make that 20-minute walk back through history, I recommend you don’t take it.